gather up once again in Kobe!!! 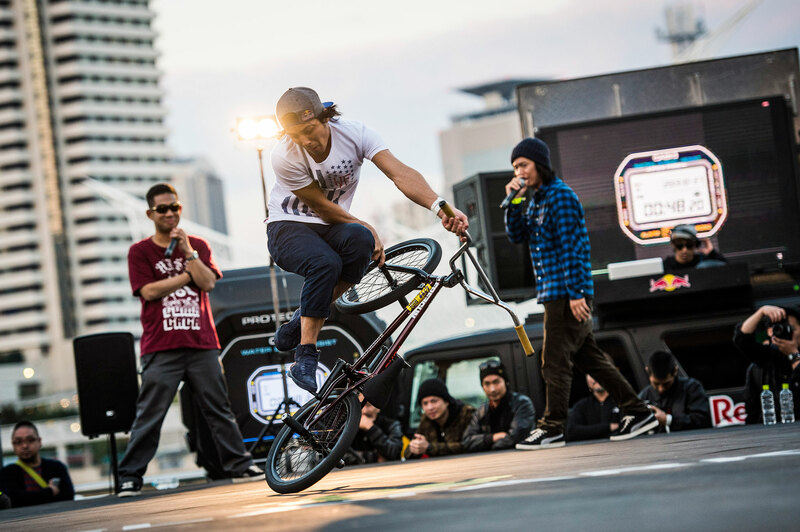 Once again, the BMX FLATLAND series has been decided to be held across 5 countries. 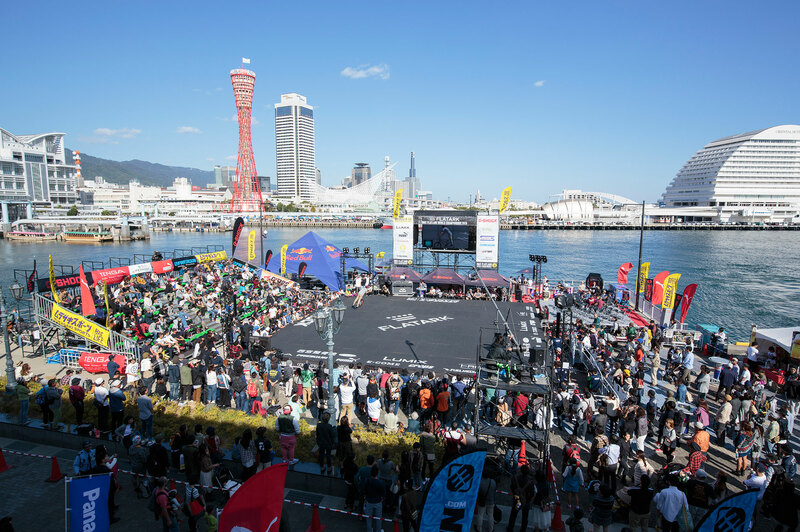 The series started from May in Switzerland, the 2nd round in Spain in June, the 3rd in the USA in July, the 4th in Canada in August, and the Finals which is scheduled to be held once again in Kobe, from October 24th to the 25th. Participants who will be taking part in this year’s final, will of course be, Yohei Uchino, the 3 time World Champion, Matti Kuoppa, legendary rider from Finland whom once reigned as the world champion, the top 12 finalists from last year, and other riders from all over the world. It would not be an exaggeration to say that this will be one of the best BMX Flatland World Finals ever. 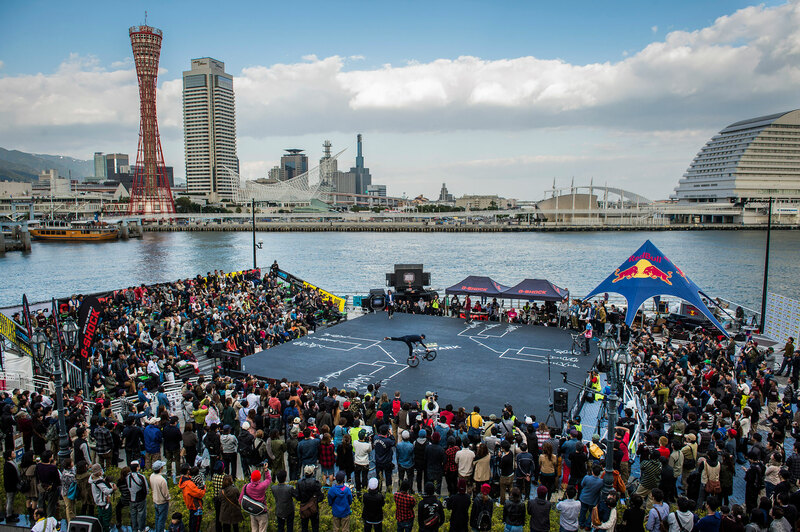 Moreover, it has been announced that there will be a prize money worth 5 million yen, the first in all street sports competition and BMX sports competition. With so much content going into this historical event, the event has been gathering more attention from people all over the world, including the media. On October 25th (Sunday), it is scheduled from 18:00 that the world’s top 12 riders will compete on a one-on-one battle. What kind of new tricks and what kind of performances will jump out this year?! And whom will win the title for the annual world champion, and the prize money, 5 million yen?! On the flat ark venue, FLATARK will no doubt become the world’s hottest No.1 World Finals, boosting the city of Kobe with excitement this year! Renowned “FLAT ARK” comes back to Kobe, upgraded. BFWC for 2014, was held in over five countries; the three countries from the previous year, plus Brazil and France. The opening series “FISE” was held in Montpellier, France in May. The second round “VOODOO JAM” was held in New Orleans, America. The third round, “EXTREME BARCELONA”, was held in Barcelona, Spain. The fourth round “Over Ground” was held in Sao Paulo, Brazil. And last but not least, “FLATARK” was held once again in Kobe Harbor Land Takahama Ganpeki on October 25th and 26th over two days. From the beginning of BFWC in 2013, FLATARK has become known as the world’s best tournament within BFWC. Its name spread throughout the world, gathering the top riders from 16 countries, making the event a more high-level sports event, and exceeding in scale than the previous year. Meanwhile, Yohei Uchino who had been winning all the qualifying rounds, once again was aiming to win the world champion title. In the finals, he ended up battling against Vicky Gomez from Spain, 2010 BFWC Champion. It was a fierce battle between the two, both not budging an inch. 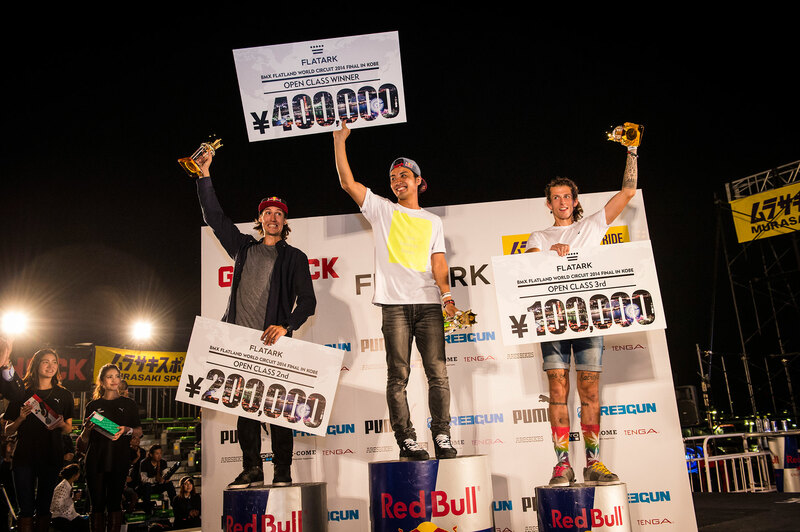 However, in the end it was Yohei Uchino’s new trick, “Bike Flip”, that killed it and led him to victory, making him the first person in history to become the annual world champion for three consecutive years. The number of audience that attended the event in 2014, was estimated to be around 7,000. The whole final tournament was live streamed by USTREAM, attracting the attention of BMX fans all over the world. 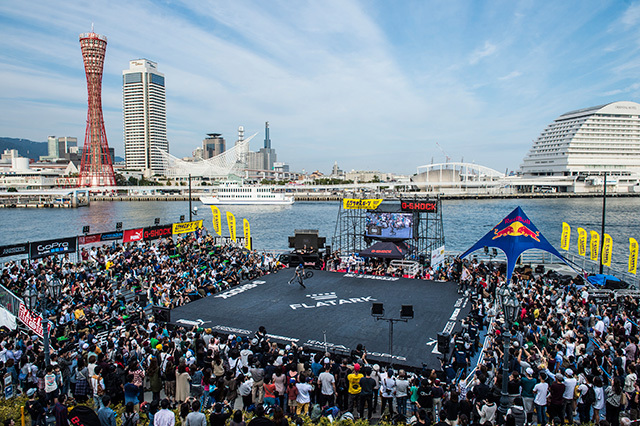 for the first time in Kobe, the holy land for BMX Flatland. 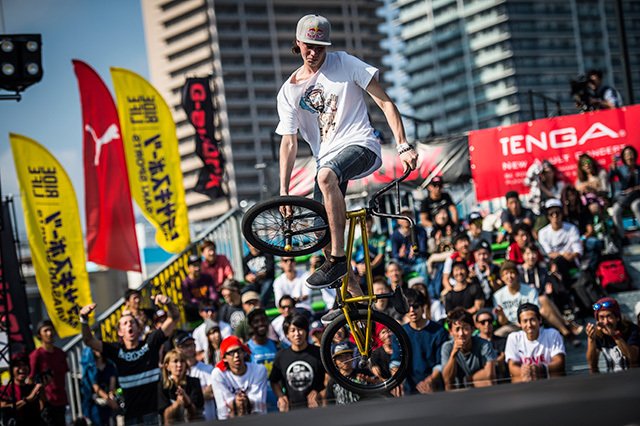 “2013 BMX FLATLAND WORLD CIRCUIT (BFWC)”, was held in a total of three places. The first stage, “VOODOO JAM” was held in New Orleans, America. 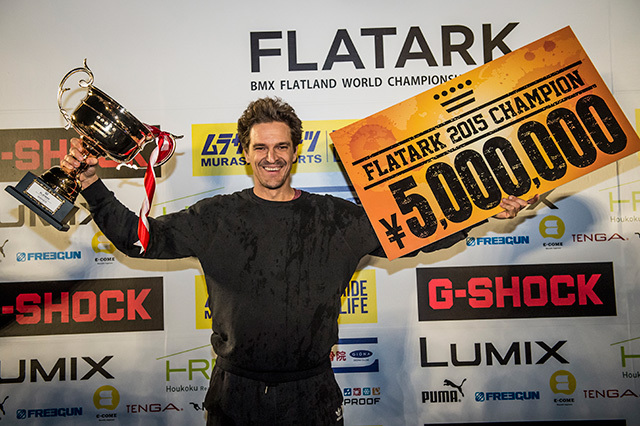 The second stage “O’MARISQUINHO”, was held in Vigo, Spain, and the final was held in Kobe, Japan which was the first time for FLATARK . In the first World Series, "VOODOO JAM", the winner was Tsutomu Kitayama, in 2nd place was Hiroya Morisaki, and in 3rd place came Yohei Uchino, whom later on became the winner of VOODOO JAM, 2014. On this year, the podium stage was dominated by all Japanese riders. In the second World Series, “O’MARISQUINHO”, 2011 BFWC champion, Matthias Dandois from France won. Viki Gomez from Spain, made it in 2nd place, and in 3rd place was Yohei Uchino. 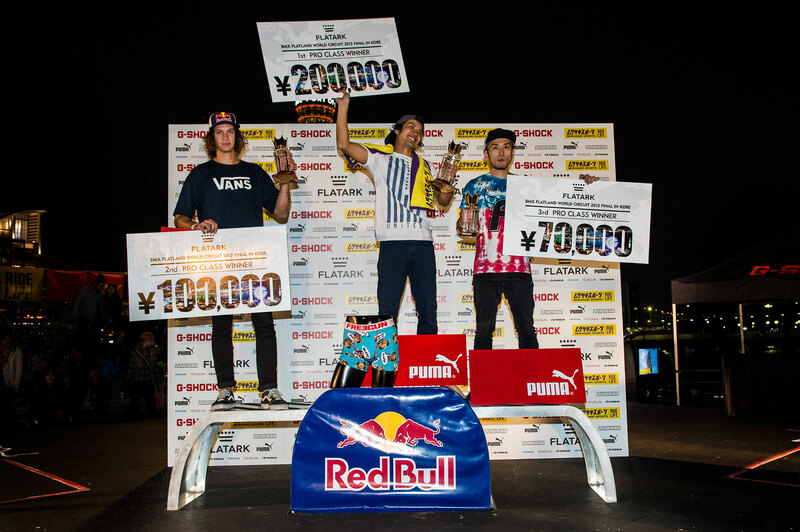 At this point, the overall ranking became disarrayed due to the points being so close, and therefore the World Final series, “FLATARK”, was selected to be held in Kobe. FLATARK was held over two days, from October 26th to October 27th at a special stage set in Kobe Harbor Land, Takahama Ganpeki. Other than the list of participants that made the crowd and event exciting, was the stage that was created in the image of an ark going out for the voyage to the next level, making the atmosphere perfect and wrapping the crowd in excitement. Due to the event being held in Kobe for the first time, the degree of attention towards the event was extremely high. 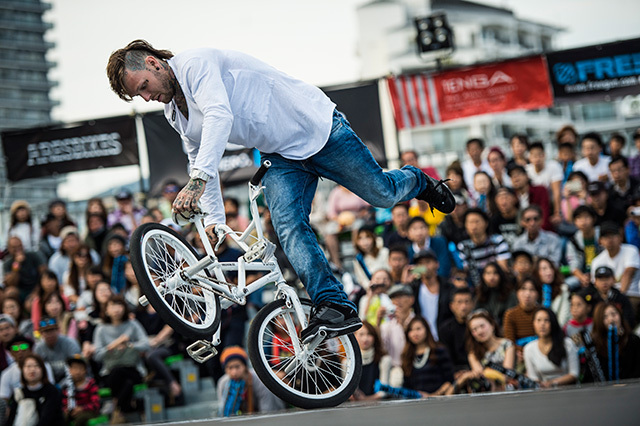 A total of 96 professionals and amateurs from Japan and abroad took part in the event, each unfolding their tricks among 5,000 spectators who gathered to watch this major event. In the tournament, although Yohei Uchino was under an immense amount of pressure to win the title for the annual World Champion 2 years in a row, Uchino’s performance showed how concentrated he was until the very end. In the finals, Uchino battled against Matthias Dandois from France, a competitor whom has been reigning in the top rankings from 2008 to 2010. The two were ranked 1st and 2nd place in the previous year, and after the great battle between both competitors, Yohei Uchino won the title in his hometown, becoming the first FLATARK champion and also the 2013 World Champion. copyright © FLATARK All rights reserved.